From Mediaite: The Today Show has officially announced their plans to replace Ann Curry. Following her tearful and semi-awkward goodbye yesterday, many speculated that Savannah Guthrie would be her replacement, and today it became official. The Hollywood Reporter first claimed this, and NBC News released their official statement later in the day. Writes Mediaite, “The news isn’t particularly surprising, as Guthrie’s name immediately made the rounds following news of Curry’s departure. Guthrie’s been co-hosting the 9 a.m. hour of the show with Natalie Morales and Al Roker. Guthrie is also NBC News’ chief legal analyst. Previously, she co-hosted The Daily Rundown with Chuck Todd on MSNBC. Curry bid us farewell on the show yesterday morning in an emotional, sincere segment…. Curry’s new role is NBC News National & International Correspondent and Today Anchor at Large.” Read the whole article here. From Gossip Cop: Breaking news! Tom Cruise and Katie Holmes are parting ways after five years together. The couple wed in November 2006 and have a six-year-old daughter, Suri. Holmes’ attorney, Jonathan Wolfe, released the statement, “This is a personal and private matter for Katie and her family,” adding, “Katie’s primary concern remains, as it always has been, her daughter’s best interest.” Cruise’s rep stated, “Kate has filed for divorce and Tom is deeply saddened and is concentrating on his three children. Please allow them their privacy.” Gossip Cop furthers reports that, “In her petition, the former ‘Dawson’s Creek’ star indicates that she is seeking sole legal custody of the couple’s 6-year-old daughter Suri, as well as primary residential custody. Holmes’ paperwork makes no mention of the pair’s prenup, but indicates that she’s seeking a division of property and a ‘suitable amount’ of child support, according to TMZ.” Read Gossip Cop’s full coverage here, here, and here. 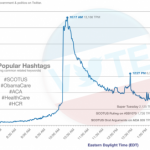 From Geekosystem: Yesterday, media outlets were abuzz with the landmark decision made by the Supreme Court in regards to Obama’s health care reform, or the Affordable Care Act. Despite the news being plastered all over the internet and television, in the world of social media, it only spawned 13,000 tweets per minute. Reports Geekosystem, this “pales in comparison to recent pop culture phenomena. 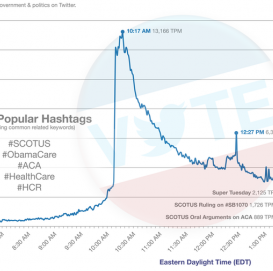 When Beyonce announced that she was pregnant, for example, the news hit around 8,000 tweets per second… Likewise, the Super Bowl had a 12,000 tweet per second peak, that’s almost as many as SCOTUS inspired in a whole minute… Why so low? It could be any number of factors: A Supreme Court decision isn’t the easiest thing to digest and comment; this was chiefly of interest only to United States citizens; some people probably aren’t too keen on broadcasting their political opinions into cyberspace; and, frankly, a lot of people probably just didn’t know or care.” Read more here. 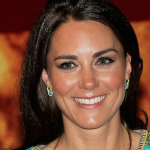 From Styleite: Is Kate Middleton going to be homeless? Yes, but for a good cause! Reports Styleite, “The Duchess of Cambridge will soon be spending a night on the streets of London with Centrepoint’s Sleep Out campaign in order to raise awareness of the mounting homelessness problem in the UK’s capital city. The Daily Mirror reports that Kate got roped into sleeping on the streets by actress Lisa Maxwell, who works for the campaign. 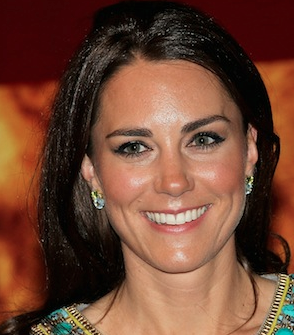 Prince William and Princess Diana have both done it before her, and now Kate is following suit. Maxwell told the Mirror: ‘She asked me about sleeping out, so I said: ‘Next time I do it, you’re doing it with me. No excuses, he’s done it.’ She said: ‘You’re on’.’ Once again, the Duchess is showing the world that she is a true class act by doing something for her community. Read the story here. 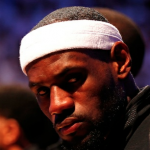 From SportsGrid: In case you still want to hear about basketball even though the NBA championship, the latest Sports Illustrated cover story has the details of how LeBron motivated his team to win the game. Reports Sportsgrid, “During Chris Bosh’s surprisingly endearing appearance on Jimmy Kimmel last night, we got a little peek into the night the Miami Heat won the title. 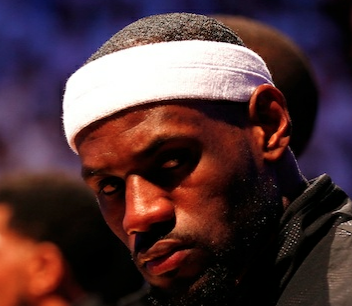 In addition to the largely unimportant details (the Heat didn’t get to Club LIV until 4 in the morning, Bosh himself stopped at Taco Bell beforehand, and LeBron James didn’t know all the words to the songs he was rapping) we also heard what James told his teammates moments before the biggest game of their lives. And it was dark.” Read the quote and the rest of the article here. 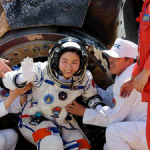 From The Mary Sue: China’s first female astronaut has returned safely back to planet Earth, marking another milestone for women of the world. Reports The Mary Sue, “Remember Liu Yang, China’s first female taikonaut, who blasted off into space earlier this month? She returned to Earth today when the the Shenzhou-IX spacecraft landed safely in Inner Mongolia at 10:05 local time (02:05 GMT). The Shenzhou-IX was slowed by parachutes as it descended back to Earth, in addition to rockets which were fired when the capsule was 1 metre above the ground, slowing the capsule to a final speed of 3.5 metres per second. Originally, Liu and her fellow taikonauts, Jing Haipeng and Liu Wang, took off on board Shenzhou (“Divine Vessel”) IX, which they docked with the Tiangong-1 module currently orbiting the Earth. There they have spent the past 13 days conducting experiments and technical demonstrations in anticipation of building a larger space station. Afterwards, they moved on to the Shenzhou-IX, the craft in which they ultimately returned to Earth.” Read the full story here. From The Jane Dough: Opening up a debate and reminding readers why it’s better as a woman to be good at your job than to be ladylike. Most recently, athletics have tried to get women to do the latter instead of the former. Reports The Jane Dough, “Consider that recent, idiotic debate over whether female Olympic-level boxers should be required to wear skirts. You thought that was silly? Well, brace yourself. The Women’s Tennis Association is launching an initiative this year to stop female tennis players from grunting. Yup. ‘Citing increasing discontent from fans,’ ESPN explained, ‘the WTA plans to launch an initiative… to teach young players breathing techniques to avoid grunting and to eventually adopt a rule against noises deemed to loud, with the help of a decibel meter.’ Reading this, it’s no wonder that Maria Sharapova today told reporters that she has no intention of trying to cut back on her grunts. This new regulation is patently dumb.” Read more here. 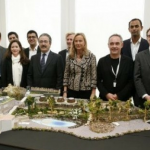 From The Braiser: Chef Ferran Adria held a case competition to help shape the future of his El Bulli Foundation, a culinary innovation lab to live on after the destruction of his restaurant El Bulli. And today, a team from Harvard beat out teams from around the world to win that competition. 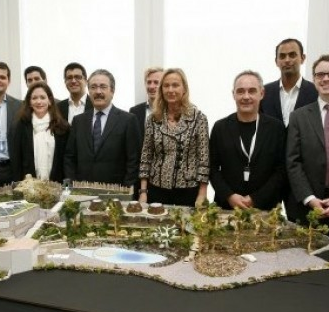 Reports The Braiser, “Since Adria’s vision for the foundation extends beyond food into the development of sustainable technology and energy, the proposals had to be deemed worthy by a judging panel made up of VIPs with ridiculous credentials, including Financial Times writer Victor Mallet, NYU Stern Business School professor Russell Winer, and Nobel Prize-winning economist Joseph Stiglitz. Seriously. The Spanish press release fromTelefonica, which cosponsored the competition, lauds the Harvard teams for incorporating sophisticated technologies (including a tantalizingly-interesting mention of bioluminescent lights) as well as creating an organizational structure devoid of corporate hierarchy.” Read the whole piece here.